The Gulf Coast Film-Makers’ Co-Op, an off campus student organization, will inaugurate its Film Factory at 8 p.m., Friday. Founded to encourage student film-making, Film-Makers’ Co-Op is a result of interest among university students for a place to show and make films. Spokesmen cite the fact that at present there isn’t any University course for the beginning student who wants to make creative films, and of the two courses devoted to film on campus, both are oriented for radio and TV majors. THE GROUP has received support from the New American Cinema groups on both east and west coasts. Independent film-makers like Bruce Baillie and Robert Nelson from California have provided films for the first program. In New York, Pop Artist Andy Warhol will provide his newest film, “Camp” with Baby Jane Holzer and Jack Smith, for one of the series of benefits that will aid the Austin film-makers in their work. The first film to be released by the new Co-Op is Gregg Barrios’ “Harley.” The film will receive a premier in November at the Cinematheque in New York City and then a West Coast showing at Berkeley, Calif. The film, described as a spoof on “underground films,” will be brought to the campus by Cinema 40 in late November. 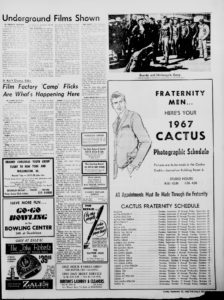 ERNEST CALLENBACH, editor of the film journal, “Film Quarterly,” said, “I’d imagine ‘Confessions’ would cause some kind of riot, in fact, if you show it in Austin.” Nelson will be remembered for his earlier film, “Oh Dem Watermelons,” shown on campus last spring. Along with these films, Gregg Bararios’ [stet] “The Way They Are,” a work in progress will be previewed. An earlier part of this film was show[n] this summer by Cinema 40. Marlon Brando in “The Wild One,” is the main feature of the evening. The program will close with a live theatrical media-mix, “Nightflight” by Howard Smagula. A contribution of $1 is the entrance fee to the festivities. Tickets may be obtained by calling [redacting], and a limited number will be available at the door. The Friday night Film Factory presentation was New York underground, but not quite. Loudspeakers were hung from nails on the wall, and at the rear of the room Greg [stet] Barrios, one of the organizers of the venture, sat beside his projector with a pile of film cans. THE AUDIENCE was boistrous [stet] until someone flicked off the lights and began the tedious process of adjusting the projector. At first the picture blurred, and then there were shadows on the screen, but at the last moment, Barrios managed to make it work, and the first film began. The reel was an excerpt from one of his own works, “Harley.” Highly evocative of Kenneth Anger‘s “Scorpio Rising” in format, it utilized fast cuts and was accompanied by a popular song. Although the film showed a certain dearth of editing and camera innovation, it was a better than average effort. THE FIRST, “The Confessions of A Black Mother Succuba,” was humorous because it was fast and violent and improbable — like most things that really are funny. The second was a film poem by Bruce Baillie called “Tung.” As the bright shadow of a girl moved through the film-maker’s memory, persons in the audience reacted at first with suspicion because they were faced with great beauty, with moving color, and something that they did not expect to see. After a moment, the place grew silent, and for five minutes everyone was quiet. It is quite difficult to describe the film because it is a uniquely beautiful visual experience. The filmmaker accomplished his effect by making a color sequence of a slowly rotating metal sphere. Probably using filters, he varied the colors with great expertise so that the result might well be what memory would look like could it be seen. On this he overlaid a negative of the girl (“her bright shadow,” he said) and she moved through the gaudy labyrinth like a flicker in the corner of the eye. When the films were ended, anonymous actors presented a live “happening” complete with strange sounds and persons dancing in improbable ways. Underground Film Journal notes: One screening, so many interesting names involved. While the first article promoting the screening somewhat implies that Barrios’s Harley is a finished film, the review indicates it was screened as a work-in-progress. The Journal will have to research if the New York and Berkeley screenings of the film actually happened. Also, while the first article indicates that another Barrios work-in-progress was going to be screened, the review makes no mention of it, so perhaps it didn’t. The Journal will also have to research if The Way They Are was ever completed. The review of the films that appeared in the Austin Daily Texan two days later was written by Whitley Strieber while he was a student at the University of Texas at Austin. Since then, he has become a well-known novelist, mostly of the horror genre. Several of his books have been adapted into feature films, such as The Hunger and Wolfen. He also wrote a famous non-fiction book about his own alien abduction, Communion, that was also adapted into a feature film. Strieber’s tone of the review is somewhat condescending of the event in general, while staying respectful towards the actual films. Published on the same page in the Austin Daily Texan, is a wholly condescending fiction “article” by James Kunetka, in which he pretends to “interview” a pretentious attendee of the screening. Why Kunetka didn’t actually interview an actual attendee is baffling. Kunetka has since written several historical books on atomic energy, as well as a few novels, including one co-written with Strieber, Warday. Approximately one month before this screening event, Canyon Cinema in San Francisco formed their underground film distribution co-op. 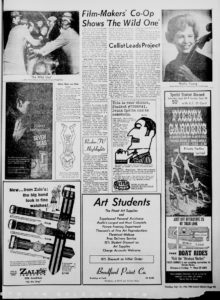 The news article says that Bruce Baillie and Robert Nelson — both of whom were heavily associated with Canyon Cinema — “provided” their films for the event, but perhaps the films were rented out through the distributor. Baillie and Nelson were part of an earlier “experimental film” screening event in Austin in April, that the Journal hopes to post an article about soon, as well. The last name to note involved with this event is Howard Smagula, an artist who was teaching at the University of Texas at Austin when he organized/directed the closing night muti-media piece Nightflight. As of this writing, he currently is an Adjunct Professor in the Visual Arts program at Stockton University in New Jersey.